It isn’t often we spend a Tuesday evening out on the town, tonight is special. 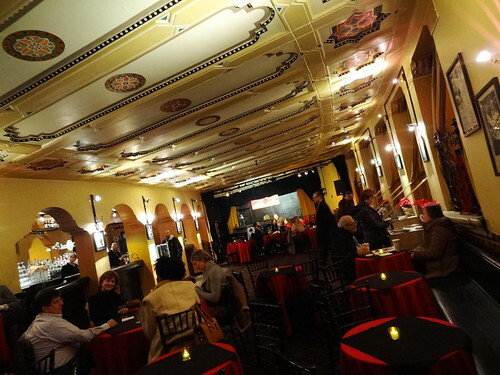 We have tickets to see Guitar Passions at Music Hall, we are making an evening of it starting with dinner at the Detroit Seafood Market on Randolph. We park in a lot that gives us access to both Madison and Randolph, $5 and we’re good for the night. This is the Paradise Valley district, historic buildings line the streets, old-fashioned looking street lamps light our way. 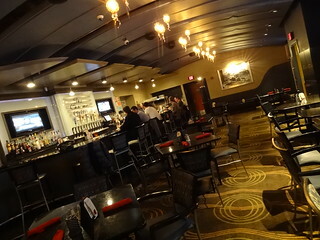 Inside, people have just begun filtering in, taking a seat at the bar or high-top table. 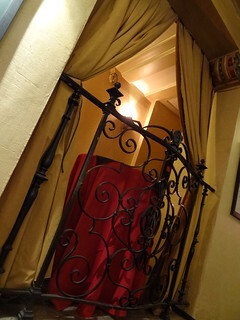 We are led across the room to a private booth, curtains are open and drawn to the sides. 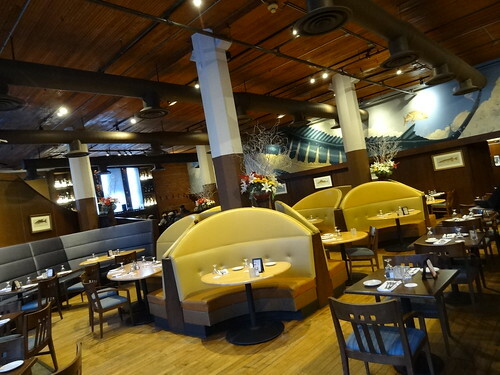 Floor and ceiling are warm shades of wood, funky shaped booths and small tables fill the space. Contemporary in style, the colors have warm undertones, an underwater mural covers the back wall. The menu is packed with fresh fish and seafood, we dig into warm bread as we wait for our meal to arrive. Our waiter is friendly and attentive, he arrives with our food and it looks delicious. I first try a forkful of Chef Leonardo’s famous lobster mac & cheese; piled high with toasted bread crumbs, inside it is cheesy, noodles are cooked just right with tasty chunks of lobster nestled throughout. 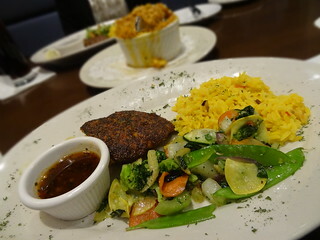 The blackened salmon with sweet chili sauce is served with jasmine rice and sautéed vegetables. We like the seasoning on the fish, the vegetables are tender and buttery tasting. We are sharing both dishes, it makes for a great combination. Kris and I bundle ourselves up, Music Hall is right around the corner, we brave the cold and walk there. 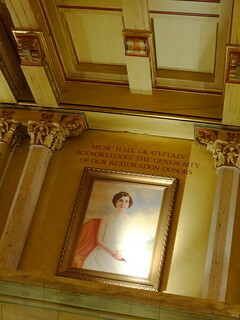 In 1928 Matilda Dodge Wilson opened the Wilson Theatre. 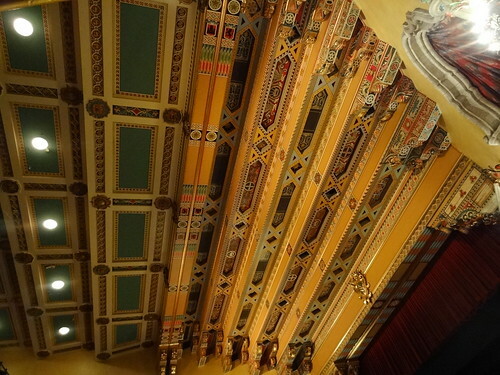 She hired William Kapp of Smith, Hinchman & Grylls to design the building; it was to be used for legitimate theatre and touring Broadway productions, total cost was $1.5 million dollars. Eventually the Wilson began showing motion pictures, Gone with the Wind premiered at the The Wilson in January 1940. In the mid 1940’s the Detroit Symphony Orchestra wanted its own hall, choosing The Wilson, the name was changed to Music Hall in 1946. In 1951 a new trend was sweeping the nation, Cinerama. Detroit was a huge market back then, it was the second city in the United states to have a Cinerama, New York was first, Hollywood CA was third. Alterations were made to the building, a deeply curved wide screen was installed by Cinerama engineers, at that time the cost of a movie was 95 cents, Cinerama cost $2.80; you had reserved seating and printed programs. 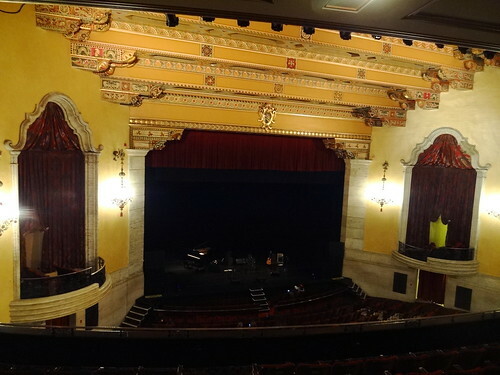 From 1971 to 1984 Michigan Opera Theatre used the building. 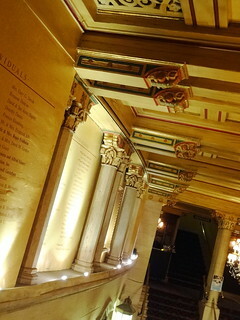 In 1991 a decision was made, Music Hall would be restored to its original condition. 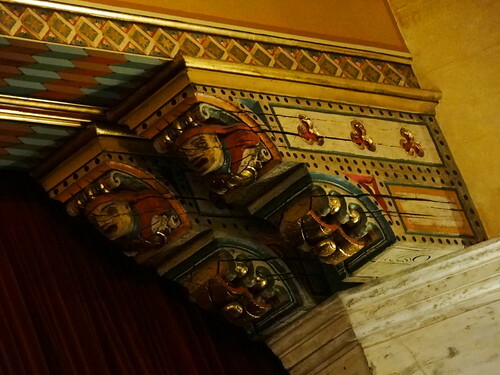 Craftsmen and artists from all over arrived on the scene, 6 stories of scaffolding filled the auditorium, the decorative ceiling was cleaned and repainted, seats were repaired and restored, in 1995 Music Hall once again opened its doors. The Art Deco exterior is orange and tan brick, large stone pillars are capped with traditional theatrical masks made of terracotta. Beautiful wood and glass doors grant us entry to the foyer and box office, a second set of doors leads us to the lobby. 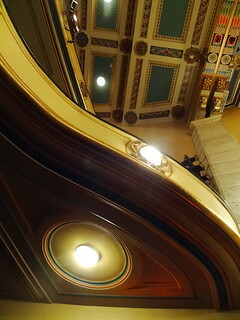 The area is surprisingly small, light-colored stone surrounds the space, chandeliers are grand, carved figures wrap the capitols of columns, exit signs are framed in brass, a portrait of Mrs. Wilson hangs prominently. From here you can either go up into the theatre or as we do, down five steps to the Jazz Cafe. 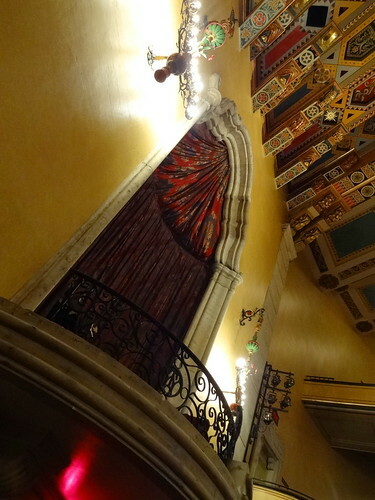 Taking a seat at a table we are afforded a wonderful view of the room; walls and ceiling are cream and yellow, elegant designs painted in red and black decorate the room, Moorish arches give visitors a view into the lobby. 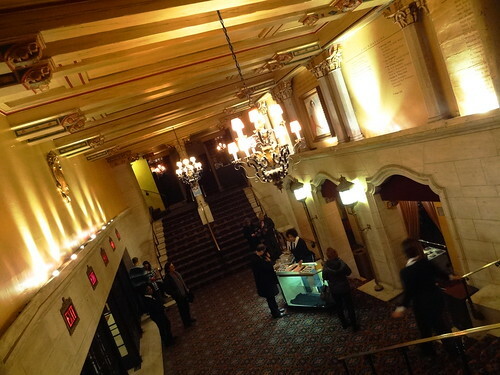 While other patrons are finishing their cocktails, we take the stairs to the main floor of the theatre–this is one of our favorite places to see a performance, as a matter of fact we were at that very first show when Music Hall re-opened in 1995. It is as fabulous today as it was then. 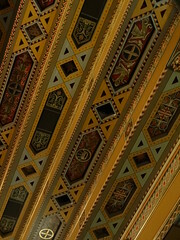 After finding our seats Kris wanders about taking photos, I sit with my head tilted back admiring the stepped ceiling beams slathered in gold leaf and colorful designs. The grand curtain hangs elegantly across the stage, the main ceiling is a series of turquoise rectangles, the back of the house is finished in walnut panels. 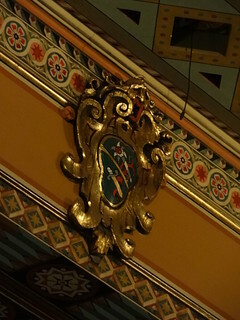 There is one box on each side of the stage–definitely the best seats in the house; open Moorish arches are fitted with a wrought iron railing, look closely to see the W T (Wilson Theatre), a crescent wrench is formed from the T, a tribute to Matilda’s first husband John Dodge. Pendant-like fixtures hang to the side 12 lights wide, they are stunning. The lights flash, the show is about to begin. 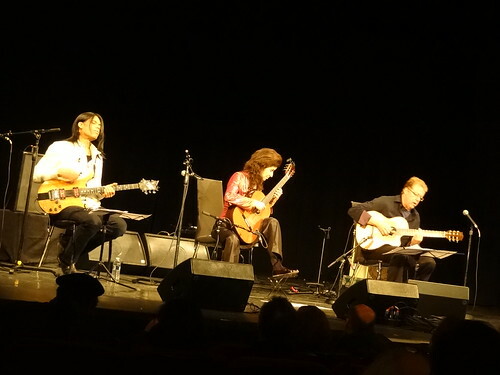 Tonight we are seeing Guitar Passions, three master guitarists playing Latin, Brazilian and Jazz selections, we are very fond of this type of music. The musicians are 3-time Grammy winner Sharon Isbin, guitar virtuoso Stanley Jordan and Brazil’s leading guitarist Romero Lubambo. Throughout the evening each plays solo and in combination with the other players, each showcasing their own unique style of play, the selection of music is outstanding, the talent, awe-inspiring. In one piece, Stanley Jordan plays the guitar and the piano at the same time, really! Some pieces are intense, it appears as if the instruments have come to life, possessing the hands that play them creating melodies that cast a spell over the audience, mesmerizing all who watch and listen. The last number brought the audience to its feet, applause was loud and lengthy, earning us an encore, awesome! 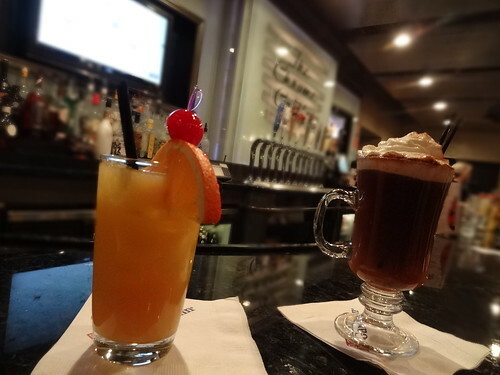 The Hilton Garden Inn is only a short walk away, we stop in at The Chrome Grille for a nightcap. 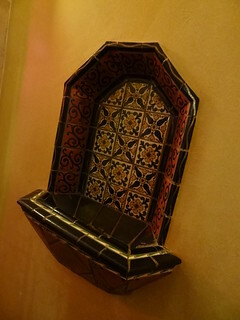 The atmosphere is casual, lighting is low, as the name predicts chrome accents are found throughout. We join the handful of customers seated at the bar and order drinks, a Spanish Coffee for me and some sort of tasty orange cocktail for Kris. It’s a nice way to wind down after a show. 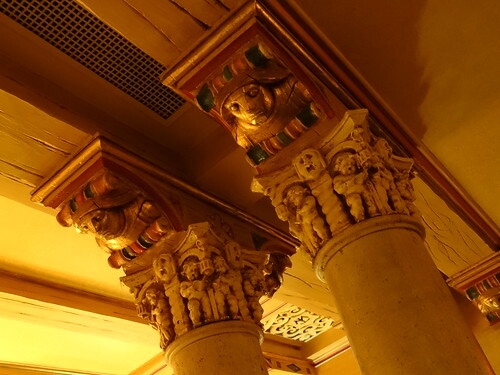 We engage in conversation with a hotel guest, he asks us about Detroit and we share some of the highlights of the city. When the glasses are empty and the conversation ends we call it a night–and what a great night it was!